The last date of submitting application has been extended till date 21st March 2019 for Departments–(VJNT) (MAFSU) and 20th March 2019 for Department–(SJSA). For other departments, apply of applications closed. This is a plan for students of government, government funded and non-affiliated colleges / polytechnics entering the vocational courses set by the government, whose students are certified by the competent authority, as a marginal farmers or whose parents are registered laborers. a) For child of Registered Labor /Alpabhudharak (Marginal Land Holder). b) For Annual Family income up to 1 Lakhs. c) For Annual Family income 1 Lakh to 8 Lakhs. - For institute in MMRDA/PMRDA/Aurangabad City/Nagpur City-Rs.10,000/- for 10 months & For Institute in other area Rs.8,000/- for 10 months. (Per District Quota 500 Note : 33 % seats are Reserved for Girls &	if unavailability Reserved girls then it will divert to boys ). Proportionate of Per District Quota is allocated as per received number of applications. a). Applicant should have Nationality of India. b). Candidate should be Domicile of Maharashtra State. c). Applicant should be ”Bonafide Student of Institute” and admitted for Professional and Technical course (Graduation / Post Graduation Degree) as mentioned in GR. d). Deemed University and Private university is not applicable. e). Candidate should be admitted through Centralized Admission Process (CAP). f). Applicant should not avail any other Maintenance Allowance Scheme. g). For current Academic Year, Only 2 child from family are allowed for benefit of scheme. h). Applicant should be child of Registered Labour or Child of Alpabhudharak or Both / Total Annual Income of Family / Guardian should not be more than 6 Lakhs. i). Minimum 50 % attendance in previous semester (Exception for fresh admitted in College). j). During course duration, candidate should not have a gap of 2 years. k). Applicant should be Hosteller. l). Should not avail maintenance allowance of any other scheme. m). Candidates are eligible those who have taken an admission under general category. n). Applicant should attempt every semester or annual exam. a). Mark sheet of 10th(S.S.C) & Onwards. b). Domicile Certificate of Maharashtra State. c). Register Labor Certificate / Alpabhudharak (Marginal Land Holder) Certificate ( In case of not a child of Alpabudharak or Registered Labour then family Annual Income Certificate ). d). Undertaking “In current year, not more than 2 beneficiaries from family”. f). Hosteller documents (In case of private hostel or Paying Guest, Agreement with owner will be required. h). Previous year Mark sheet. Applicants will be able to register themselves through online registration process. Online Registration done through the website http://www.aaplesarkardbt.gov.in from any of the internet access point. 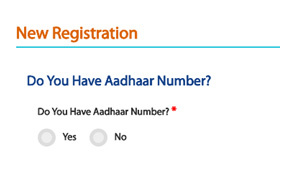 Step 1 - Do You Have Aadhaar Card? Please select ―Yes and click on Continue button to continue with Registration process. Biometric – If the mobile no not registered with Aadhaar, then the user can select the authentication type as Biometric. 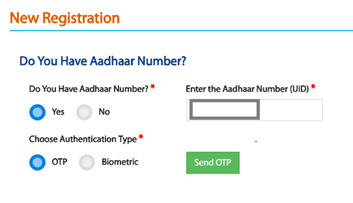 If your Mobile Number registered with Aadhaar, then choose the authentication type as ―OTP. 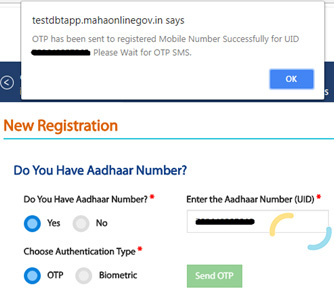 An alert message displayed saying that – OTP for Aadhaar authentication has been sent to your Aadhaar linked registered Mobile number. Click on OK button. 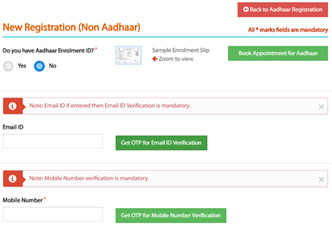 Post Successful OTP verification the Applicant details fetched from UIDAI will be auto populated in the Personal details fields Personal Details, Address Details, Bank Details. If there is any change in the details, the applicant should contact UIDAI to update the relevant information. Creation of Applicant’s Username and Password - Applicant will need to create the User Name and Password to access the system in this step. For Username, suggestion is also provided which are not used in the system as it should be unique. Also Username should contain only alphabets and numbers and Username should be greater than 4 characters and less than 15 characters. Step 1: Click on New Applicant Registration. Applicant can have multiple Scenarios for Registration as below. If Yes is selected, “Do you want to know the status of Enrollment ID?” is asked and again if Yes is selected. UIDAI page will get opened in new tab and the above screen will get displayed on the Portal. 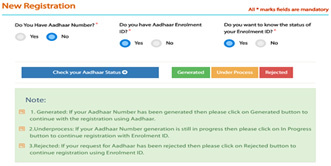 If Applicant clicks on “Under Process” button then will be proceeded for Registration with Aadhaar number screen. Again question will be asked, “Do you want to know the status of your Enrollment ID? 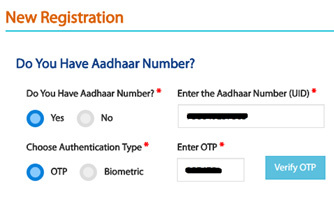 And if No is selected then New Registration (Non Aadhaar flow) screen will be displayed. 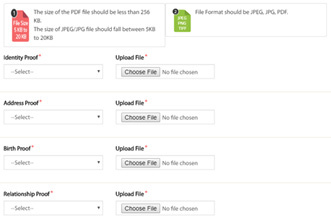 Here user will upload the photo required according to the Portal’s requirement. In case Applicant is not having the image as per requirement, applicant can click on “Click here to Crop Photo” button and on new tab screen will get opened. 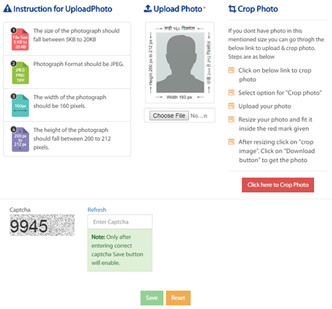 Applicant can edit the signature as well as photo and then upload it to the portal. 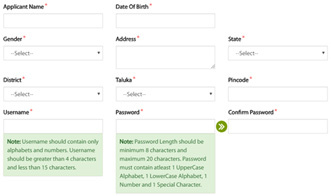 After the above steps, User needs to enter the CAPTCHA and click on save in order to get Registered. To login into Aaple Sarkar DBT portal, Applicant has to perform following steps. 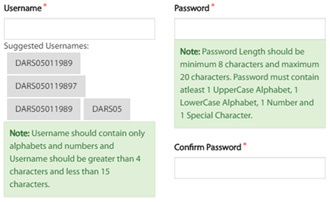 b) Username & Password – Enter the Username and Password as entered during registration. If Applicant Forgets User Name then Click on Forgot User Name button on the Home DBT page. After entering the details, Click on Get User Name button. 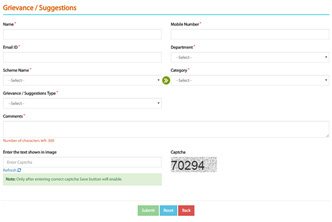 Applicant will receive SMS on the Mobile number which was used while registration into the Portal. 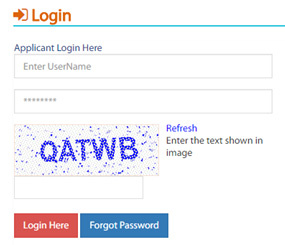 If Applicant Forgets Password then Click on Forgot Password button on the Home DBT page. After the above step user will have to click on “Get OTP” button. SMS will be received on Registered mobile number. 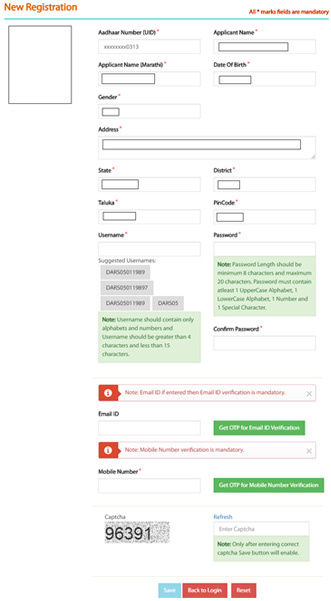 User will have to enter OTP. Enter New Password ,Confirm Password and click on Set Password button. After Successful Login to the Portal, the user will see Welcome page by default. 1 Home Page Information: The applicant can view profile completeness status and add or update accordingly. Do you have Caste Certificate? Did you receive the certificate from Aaple Sarkar Seva Kendra or Aaple Sarkar Portal and have a barcode on it? Do you have Income Certificate? Are you Domicile of Maharashtra? Do you have Domicile Certificate (Self/Parents)? Is your Jandhan Account linked with your Aadhaar? 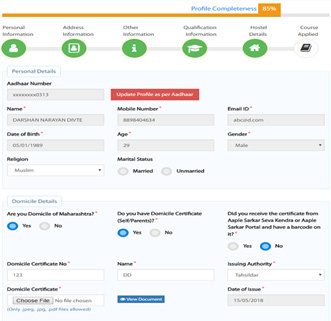 Home button will display the landing page of the Portal where “Suggested eligible Schemes” according to the Profile will be displayed. System will suggest schemes to applicant only after filling up the profile to 100 % completeness and on the basis of Caste, Religion & Income. 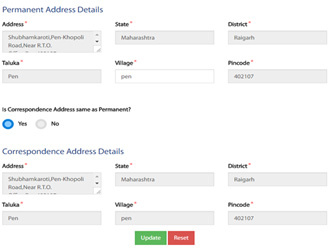 If clicked on All schemes, System will display all the schemes on the Portal. 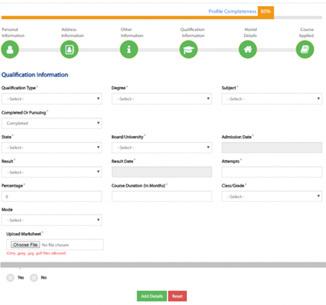 In order to check for the total number of schemes applied, applicant should click on applied schemes button. After Application is submitted successfully by applicant, it will be displayed in under Scrutiny Applications section. Applicant can click on Cancel button if want to take back application form. 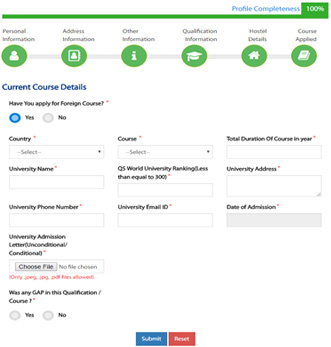 Applicant can click on view button if want to view Applicant Details section. It is also possible, Application is sent successfully but during scrutiny major/minor issue is found. At such stage, Desk officers can send the application back and Applicant can view the application again after login. Reason for sent back will also be provided by respective officer which will be displayed to the Applicant. 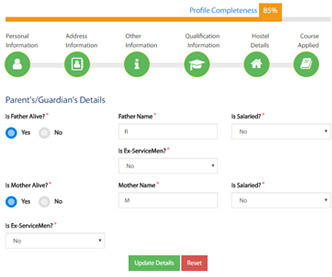 Applicant can also view the Tentative benefits by clicking on Tentative benefits button. These are the Tentative Benefit calculation which are displayed by System as per the Profile filled by the Applicant and as per the scheme applied by applicant. After the successful submission of application from applicant’s login. Application will be checked by respective Institute and Department. 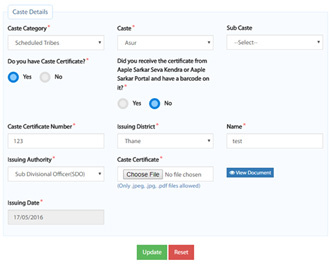 After the Application is approved by Desk 2 officer of Department, Status of the Application will change to Approved and will be displayed under Approved Applications tab from Under Scrutiny. If under any of the Desk officer Application is rejected, then the application will be displayed under Rejected Applications tab. Rejection can be totally invalid Application or maybe also Fraud applications. In My Applied Scheme, User can Set Schemes Preferences- Applicant can be eligible for more than one scheme in the Portal. 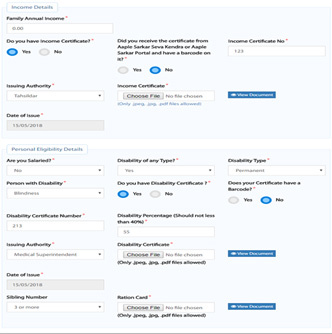 At such situations, User can apply for more than one scheme but Scholarship/Freeship amount will be disbursed into bank account only for one scheme, according to the Preference set by the Applicant. 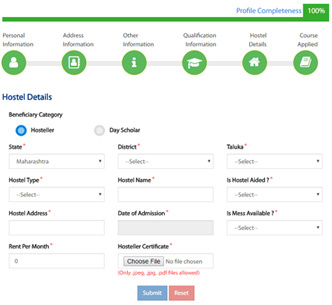 Applicant can Cancel the scheme after successful submission to the respective Institute/School by clicking on Cancel button under Action column in My Applied Scheme option. Applicant May have Grievance (Complaint) / Suggestions for Aaple Sarkar DBT Portal. 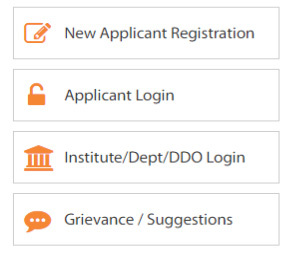 In Such scenarios, Applicant should click on Grievance/Suggestions which is displayed after login under left hand side panel of the page. Also it is necessary to enter the CAPTCHA, only then Submit button will be enabled.